MCLEAN, Va., 2019-Jan-30 — /Travel PR News/ — The Big Game is here, and while both teams are busy preparing to take the field in Atlanta, hotels in the area are busy preparing for the most-watched American football event of the year. Hilton Atlanta, located just one mile from Mercedes-Benz Stadium, the center of Sunday’s festivities, and within walking distance of many other pre-game activities at Atlanta’s Centennial Olympic Park, is preparing to host thousands of overnight guests, proving that the teams aren’t the only ones making important plays this upcoming weekend. His second move was a tactical one: “Since our hotels are a prime player wherever the game is, we’ve got a pretty significant playbook, so we pulled that out and started working the plan while also building on it and customizing for Atlanta,” he said. To help, his team started calling properties in previous host cities, including Hilton Minneapolis, which hosted last year. The result: a final playbook that includes a combination of tips, tricks and best practices from the past as well as new creative ideas, and that addresses everything from crowd control to the type (and amount) of food and drinks that best suit the occasion. 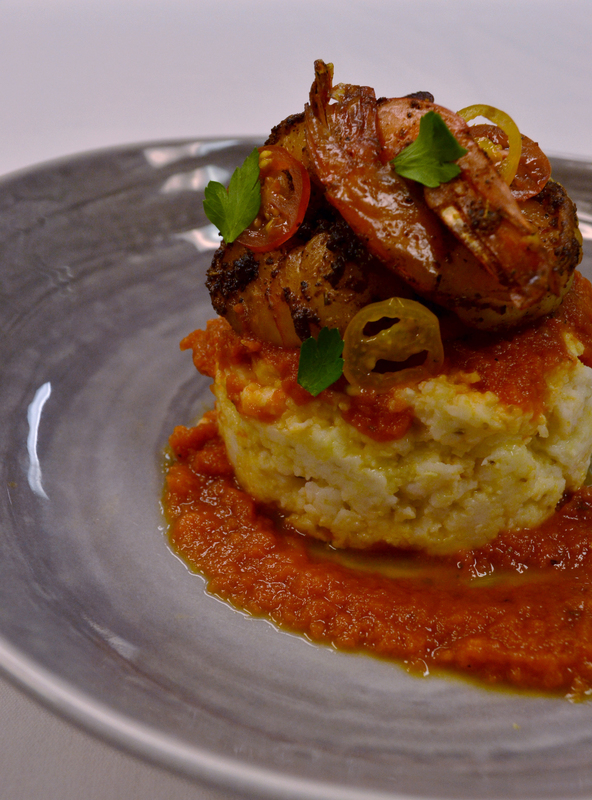 For Hilton Atlanta this year, that means setting up a shrimp and grits bar to please palates and pay homage to the southern host city (see the recipe below); doubling staff and adding lobby ambassadors to direct guests and improve foot-traffic flow and extending the hours of bars and restaurants to accommodate late-night cravings and celebrations. The need for late-night food and beverage options was one of the biggest tips Hilton Atlanta received from Hilton Minneapolis, with the Atlanta property extending food service until 2 a.m. and drinks until 4 a.m. There will also be a pop-up beer bar in the lobby, a giant lobby TV, vodkas infused with flavors and colors of competing teams’ uniforms, and a grocery list that sounds endless (16,000 eggs, anyone?). In fact, some of the biggest preparations are happening behind the scenes in the hotel kitchens, which are supplying food and drink for the hotel’s multiple bars and restaurants including Nikolai’s Roof, Trader Vic’s, which is known for its iconic Mai Tai cocktail and Southern Elements, which offers traditional Southern cuisine with a contemporary twist. If history is any indicator, it will be a heavy lift. Jordan Spiros, Director of Restaurants at Hilton Minneapolis, shared that over the course of the Big Game weekend last year, the hotel sold 6,555 beers and 8,374 cocktails. Those who are looking to get in on the culinary action but can’t quite make it to Atlanta can bring the party home with one of the below recipes from Hilton Atlanta. This entry was posted in Business, Festivals and Events, Food & Drinks, Hotels, Resorts, Sports, Travel, Travel Services, Travelers and tagged Atlanta, big game, Brad Koeneman, Hilton, Jordan Spiros, Marco Foelske. Bookmark the permalink.